Sherry's Colored Pencil Corner: Illustration Friday - "Neighbor"
I finally found ten minutes (really ten minutes!) to sketch this little neighbour I'm always happy to welcome back to the neighbourhood. His appearance means spring is really here. ACEO size, Polychromos on Somerset velvet newsprint grey. what a sweet little guy.... I think robins are such a lovely sign that warm weather is here to stay. Wow that is a great sketch to do in just 10 minutes! I love watching birds from my window too. They are some of my best neighbours! A very sweet sketch. 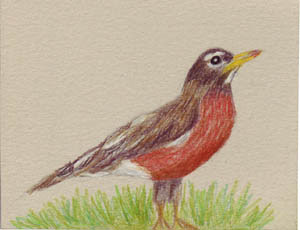 I've been seeing robins in my back yard lately, only they fly away before I can take a picture of them. Wonderful sketch! I've always wanted to go to Nova Scotia. I think I lived there at some point as a baby, but I can't verify that info now. We came to the states when I was two...sooo many years ago! But now, as an adult and as an artist, I'd love to spend some time there.